Here are the components that should be included within your Art package. Huge 10” x 13” envelope to put it all into. A word about slides being included in your art presentation package: If you’ve been in the art world awhile, you probably have quite a few slides. In earlier days, a slide package was the norm, but today, well, with computers being a major part of most businesses for the last 10 years, you gotta get into this century. You obviously have a computer, so why not utilize it. Most photography shops can transfer those slides to DVD or CD with ease, and not at a great deal of cost. And cost can be a major issue with slides, especially if you’re shipping out 100 or more packages! Also, when a gallery director is reviewing those slides, they typically just hold it up to a good light source, with no magnification. How do you want your first impression, on a 1 inch square film that can bearly be seen, or a nice 17” to 30” LCD computer high definition graphics screen. Your statement, bio, and cover letter should all be on stationary that has a professional letterhead. This is easily accomplished with most word processing software today. Avoid however, the use of to much flourishes. This will keep your art presentation package professional. What you want is to be judged by your art, not your stationary. SASE, always include it. Your self addressed and stamped envelope should include enough postage to return it to you. In the return address (upper left hand corner) include to whom you are sending the package. When it’s returned, you will know who it came from should they not include any kind of letter as to your status with them. You also put your stiffening cardboard in this envelope. This protects your package from being bent up in both sending and having it sent back. File formats can be JPG, or Tiff as again, most computers will be able to preview these quickly and easily. If you have any doubts about a particular image, leave it out! Only the best of the best go here. If the gallery needs more, they’ll surely ask! Stay focused!, don’t send a mis-mash of work in different styles or mediums. Usually you best work is your latest work, don’t send old stuff. Include the Bio/Resume, Statement, and other information on the CD also. The CD should have a slip cover design. If you have the ability to burn the cover design onto the CD so much the better, but at least put in some form of cover within the CD sleeve. The cover should also include any contact information should it get separated from the rest of your package. Now that you’ve got everything together for your package, lets pull in this wagon train into a circle and regroup for just one minute! How do you get a gallery or print publisher interested in your work without sending this complete package. You can fore go the cost by sending something that is quickly becoming an industry standard. This is a mini version of the art presentation package. This is usually what is sent first! So, lets discuss the brochure a bit! All the work you’ve completed thus far will help you in creating your brochure lickity split. The brochure is a full color page on a good quality paper or card stock. The back of the page can be full color or just black and white. The front will show 1 to 4 images of your best, very best, best of the best work! And some contact information. The back will have a very short bio and statement about your work. It can also be a bi-fold or tri-fold version on 5”x 7” or 6” x 9” paper, but the best in my view is the full 8.5” x 10.5” that can really show off your work when the director pulls the sheet from the envelope. You will include a cover letter with the brochure when it is sent. When the gallery or publisher likes your work, and asks for more information and images, you’ll have the full blown art presentation package ready with CD, etc., to be sent. Below is an example of my older brochure that has been used within my art presentation package. It just isn’t a courtesy! It provides for the context of the why you have sent this package. It needs to include the following. An introduction paragraph, that says who you are, and the purpose, the why you have sent this letter. "I am a painter and am writing to acquaint you with my work.."
A boasting paragraph, that pulls from your bio/resume a few highlights. "Solo exhibitions in Blank City, Interesting Gallery, and my paintings have been included in exhibitions XYZ. In addition, my work is included in public and corporate collections, including 123 Corp, Richmond, VA, and etc., etc." A very short artist statement, again, just an exert from your more lengthy one produced earlier. 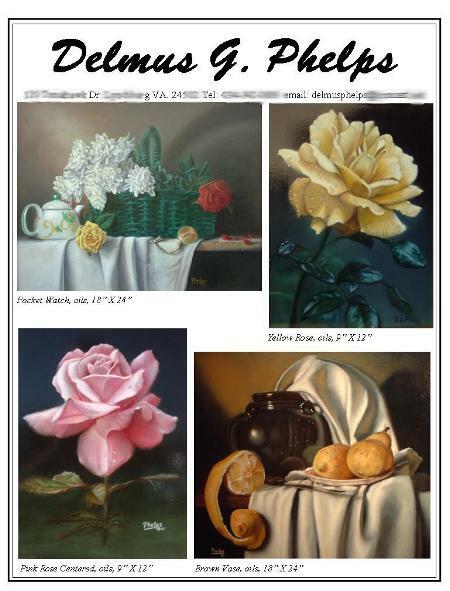 "Enclosed is a brochure featuring examples of recent paintings, and if you have an interest in seeing more I can send additional examples and materials." 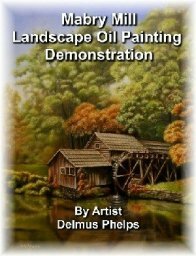 "Enclosed is a CD (or slide package) featuring recent paintings, and if you like what you see, and have an interest in more, I can send additional materials." "I have visited your gallery on a number of occasions and believe my work shares a commonality with the work of the artists featured." 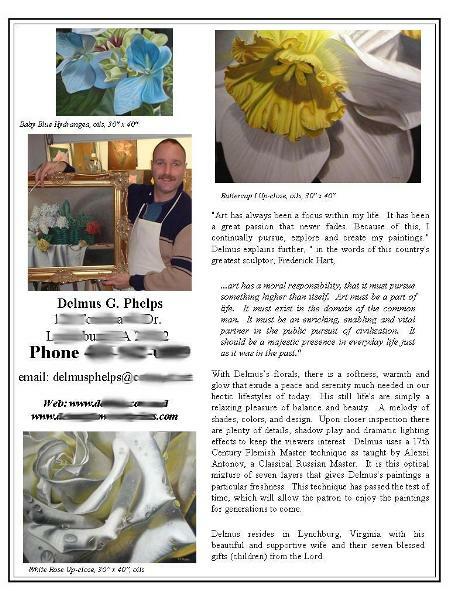 "I have enjoyed viewing your publishing catalog at a local gallery for prints, and believe my work is in line with some of the art that is presently represented by your company." 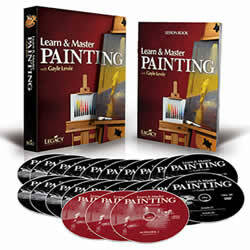 Or if a gallery or dealer is the focus of your package, include the retail price range of your work. For example: "The retail price of my work is $500 for smaller works to $5000 for the larger pieces." The reason for including this in an initial contact letter is to help the viewer understand your work is selling, and at what price ranges they can expect. If it's really in a lower range, don't include it. A cover letter, well written, will really give you a good first impression. This is what is needed in putting that first step forward in any long term relationship, like gallery or print publication representation. A great cover letter and the mini-art presentation package (or brochure) is your start! Back to the top of our Art Presentation Package example.